Last week we announced the release of the Visual Studio Tools for Unity 2.0. VSTU is Microsoft’s free Visual Studio add-on that enables a rich programming and debugging experience for working with the Unity gaming tools and platform. For VSTU 2.0, the team put a strong focus on improving and optimizing the debugging experience. Since we released VSTU 1.9 almost a year ago it has been downloaded over 300,000 times. Over the course of the last year, we shipped two previews of VSTU 2.0: VSTU 2.0 Preview and VSTU 2.0 Preview 2. Each preview allowing us to share new features and bug fixes as soon as they were ready. The team would like to use this opportunity to thank everyone who participated in these previews by sending us suggestions on UserVoice, reporting bugs on Connect, or simply reaching out to us on the Visual Studio Gallery or at the events we attended. We’ve seen many games this year that were developed using VSTU, and we couldn’t be more proud! Code Coloration for Unity’s shaders on Visual Studio 2015: Through our code coloration support for ShaderLab, Unity’s Shader language, you can now write both your Unity scripts and Shaders from within Visual Studio. 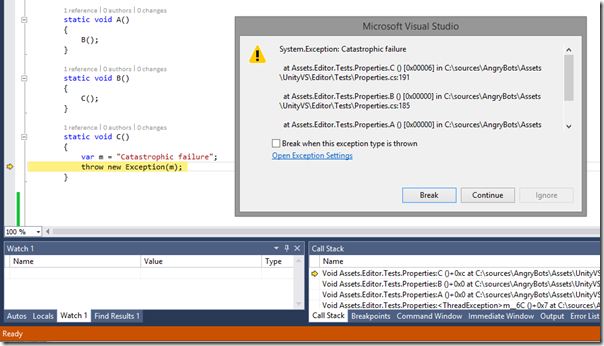 Experimental support for breaking on exceptions: You can now configure VSTU to break on exception and debug the state of your program when an exception is thrown. For a complete list of new features and bug fixes in each release, please read our changelog. As always, if you have any suggestion for VSTU, please post them on UserVoice, and if you encounter any issue please report it through the Visual Studio Connect site. We’re very excited for the future of VSTU, especially in the light of our partnership with Unity. For our next releases we’re going to focus on an even tighter integration with both Visual Studio and Unity. We’ll have more to share in the coming months. 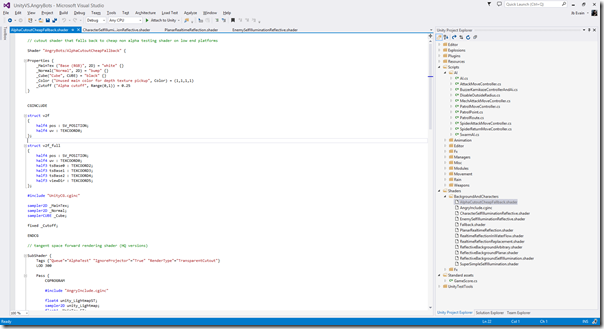 Jb runs the Visual Studio Tools for Unity experience for the Visual Studio Platform team. 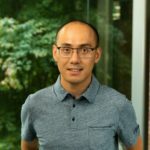 He joined Microsoft as part of the acquisition of SyntaxTree, a company he founded and where he led the development of UnityVS. He has a passion for developer tools and programming languages, and has been working in developer technologies for over the last decade.